Rock n’ roll music hits of the late 50’s had its variety of flavors, and one star performer of that era was a young man with a big voice and plenty of stage savvy - Bobby Darin. Beginning as a pure pop sensation with his first big hit “Splish Splash,“ Bobby Darin continued to make the charts with a series of teen dance favorites, but really found his true talent as a versatile big band vocalist who would load solid gold dynamite into any jazzed up classic. His most memorable of these hits were “Mack the Knife,” the song of the year for 1959, and continued in this exciting genre with “Beyond the Sea,” “Lazy River,” “Bill Bailey” and other smooth glamorous hits. His real talent was in his heart-pounding live performances in the very top, cream of the crop exclusive clubs of Las Vegas, Hollywood, New York, Atlantic City and more in the resort capitals coast to coast, and was considered as a performer on the same superstar level as Frank Sinatra Dean Martin and Sammy Davis Jr.
Leaving the world much too early at only 37, Bobby’s legacy of legendary performances lives on in tribute by national variety celebrity tribute performer Tim Beasley, who has himself been a lifelong fan of the man. Bringing those grand and glossy tunes to your stage, Tim will invite you along on a most memorable one-hour imaginary ride down “the Vegas Strip” in a live - pumping show with sizzling renditions of those super Bobby Darin tunes. Available for your event, from the Atlantic to the Pacific, Canada and overseas too! Imperial Plaza, a Brookdale Community. Brighton Gardens, a Sunrise Community. The Gardens of Warwick Forest. Seacrets, Ocean City, MD, mega nightclub. 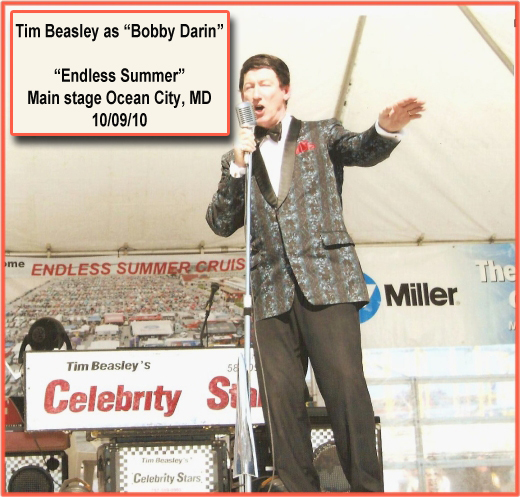 “Endless Summer” a 4-day major custom car event in Ocean City, MD. First Colonial Inn, Virginia Beach, VA.